Prince Oberyn attempted to finally get his revenge on the Mountain at the premiere for the final season of Game of Thrones. Being able to see again probably helped him a bit. 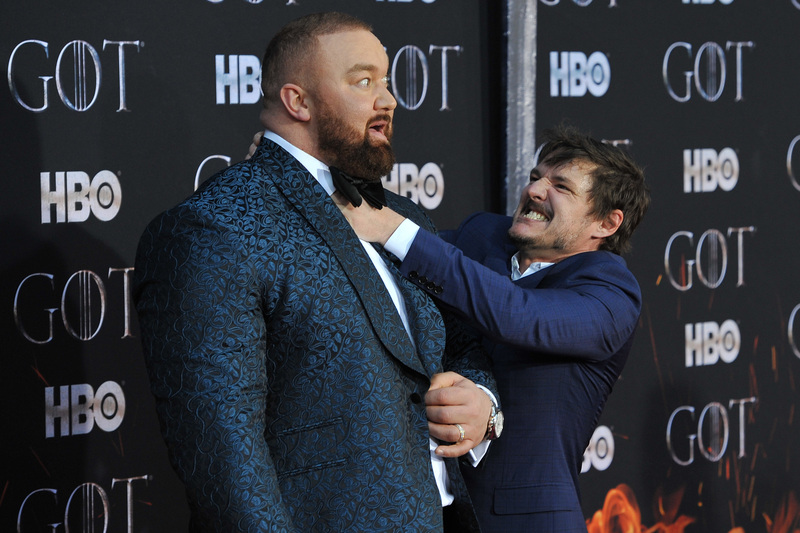 Pedro Pascal and Hafþór Júlíus Björnsson, aka Oberyn and Gregor Clegane (the Mountain), were among the many GoT cast members, both past and present, who walked the red carpet in New York for the premiere last night (April 3). With just 10 days to go (or 11 for us Brits), until the highly-anticipated final season gets underway, fans are being encouraged to rewatch old seasons to ensure they know every little detail of the storyline. But in case you’re not caught up by now – season four spoilers alert below! I’m sure most people will remember the trial which took place between Oberyn and the intimidating, 6’7″ Mountain in season four, which saw the Viper confidently say ‘this is not the day I die’, before promptly dying in a very violent manner. While gouging his opponent’s eyes out, Clegane admitted to murdering Oberyn’s sister and her children, but the Prince unfortunately had his skull crushed before he could avenge his sibling. Needless to say, that was the end of Oberyn. But he, or at least the actor who played him, pretended to come back for round two last night. Björnsson was posing for photos on the red carpet, and though he was looking sharp in a suit and bow tie, he wasn’t exactly dressed for battle. Still, it didn’t stop Pascal storming the photoshoot and jokingly attempting to strangle his cast mate. 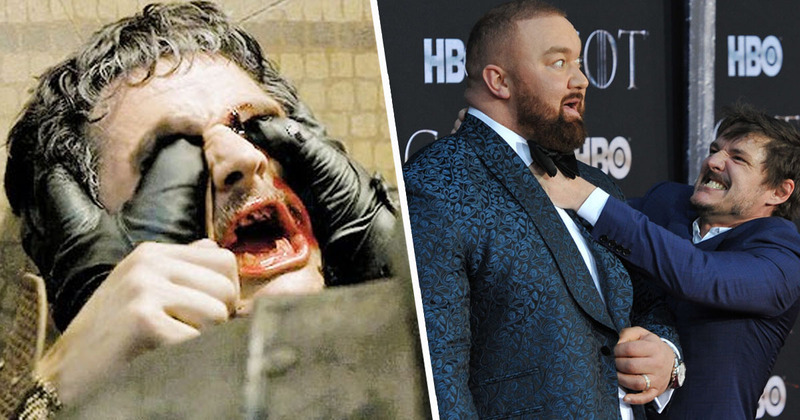 The star’s huge stature was still no match for the actor however, and his hand actually looked comically small as he wrapped it around the Mountain’s neck, even with Björnsson pretending to choke. Luckily the pretend murder attempt seemed to be enough to satisfy Pascal’s need for revenge, and the pair put the past behind them as they laughed and hugged. Pascal even recreated his character’s final moments for the cameras as he poked his thumbs into his eyes, though it was slightly less convincing without all the blood and special effects. Still, it’s nice he got to relive his Game of Thrones days before the series comes to an end for good! According to writer Jane Mulkerrins, who wrote for The Telegraph after attending the premiere, the first episode of season eight focuses heavily on reunions, ‘many of them familial and long-awaited… others less so’. Thankfully fans don’t have too long to wait until the final season begins and we can see all the characters back in action!